Yep am in NZ now , arrived 31st March , not April fools day , so its not a joke . Guess what its a NISSAN station wagon . 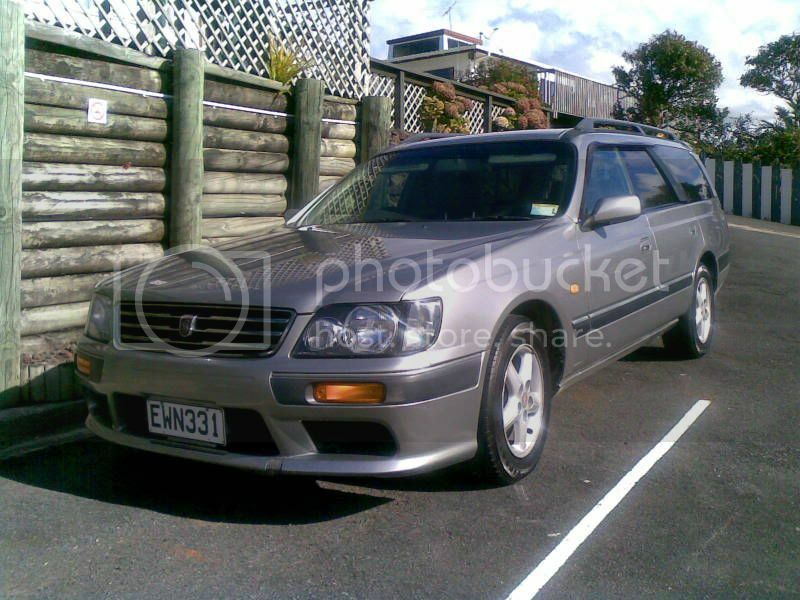 Its a 1997 Stagea , wagon version of a Skyline . Has a 2500cc dohc 24valve inline 6cyl rear drive . only done 106000kms all for $4400 oz dollars . Has a very similar engine to what i raced in the red wagon . I have in a container on a ship somehwere out there ,a new 3000cc engine I had built up for the salt . This will go in the "NEW" wagon just for running around in the hills are alive to the sound of bleating sheeps type countryside . Pics soon when I get back on my own puter . Yep , I know them wagons. Ya cun fut 3 sheeps und two bales uf hay un thu beck,or 5 sheeps und no hay, und still gut room up the front for ya fush & chups! Don is now Away with the Sheep! Just got off the phone with Rob Carroll and have demanded that the official background music for the start line for SpeedWeek 2010 be Bach's Cello Suite No. 4 Prelude. I think he might even go for the Hawaiian music or the "Into the Red" soundtrack - The BRM recording!!!! A different kind of classical music! Wide variety of composers over a long period in history but ohh the beautiful music. Hey , over here , me waving from across the ditch . Been here in NZ nearly a month now and surviving well . Few things I noticed , gasolene prices dont jump all over the place ( in fact it hasnt varied one bit since we been here ) , the trade off is that petrol is $1.60 ltr but the crazy thing is deisel is 99c ltr . They tend to drive like they think they all world rally champs on the twisty bits ( probly cos theres not many straight bits ) . Oh yeah and rains a bit more and its all very green . Things we done , bought a house in Paihia ( 230 km nth of Auckland ) , plenty of car and workshop space . I have joined the Bay of Islands Vintage Railway so I can play trains with the rest of the grandpas , reckon that beats bowls . NZ update Ok here I am looking at my 1st new pair of gumboots since we left the dairy farm in cold wet Victoria in 1967 . Yep its a bit cold and wet and I,m off to the Hamilton field days to maybe slosh around the paddocks to get some ideas as to what to manufacture . We moved into our house in Paihia and all our worldly goods (215 boxes , items , stuff ) is in . Even have the Nissan race engine sitting on a stand now and tool boxes are open . Um what the heck am I gunna use engine for now ? Hey Don just go and get another Nissan and turn it in to a race car fishing boats all sounds very boring find the closest cuircut join a car club and have some fun ! next thing you know you will join the local bowls club if your not carefull. I heard thru the grape vine that there was to be a meeting of the DLRA blokes and blokettes in Brisbane on Sunday . Have to aplogise for non attendance , mainly cos we in NZ and we had made prior arrangements . OK this is what I drive now . Its not a DATSUN , Mr Ellis . Its a NISSAN , pronounced neesarn by the yanks . What's that funny thing in the middle with the alphabet on it Don? and one can only imagine what aural horrors are contained on that CD in the console.........!